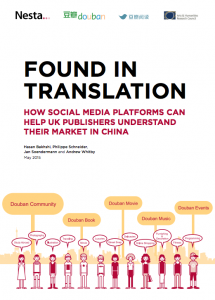 A new report, “Found in Translation,” by Nesta, The Literary Platform, and Douban Read shows how social media can be a gateway to the Chinese book market. The opening up and continued fast growth of the largest nation on earth has not passed by Britain’s cultural industries. The statistics are now well rehearsed. China is producing 20 million new English speakers every year. Almost one quarter of students on full-time taught postgraduate courses at English universities are Chinese. Such trends point to very significant future expansions in the English–speaking market for British culture. The Internet, with its promise of low cost distribution channels for cultural producers, has added to the excitement. It is estimated that at the end of 2014 the number of internet users in China had reached 249 million people. Such developments reflect a broad perception that China’s rise creates market opportunities on a massive scale for UK cultural producers that are quick to take advantage — a line of thinking that can be traced back to the old industrialists’ dream that if one Chinese man wanted to lengthen his jacket by only an inch, cotton output from their mills would be boosted by millions. In fact, there are stark differences between Chinese and Western book consumption habits which present considerable hurdles for UK publishers – the undeveloped nature of the e-book market, the popularity of online fiction (dominated by local talent), a seemingly low willingness to pay, attitudes to piracy and last, but not least, an immature understanding of Chinese readers’ preferences. This is not to mention the more general costs of doing business in countries like China where governance and market institutions are often weak or missing. As a consequence of all these factors commercial uncertainties are considerable. Where should UK publishers and writers be focusing their efforts? In this paper, we explore how they can negotiate such uncertainties by using data from online social networks which the Chinese public has been particularly enthusiastic to embrace. Douban presents a unique opportunity in this regard. Being at the same time a social media platform, a publisher and a retailer, the platform permits rights holders to take a data– driven approach to engaging with readers, understand their wider cultural preferences and behaviours, and identify – and exploit – their influence in social networks. We examine these opportunities through the lens of an experiment with the novelist, David Mitchell that took the form of an online translation contest held in September 2013 and that we designed for the purposes of this study.